The University of Minnesota Medical Discovery Teams (MDT) have been making a significant impact since their inception in 2013; from new hires to impressive research grants, their success has been widespread. Today, four Medical Discovery Team members– Drs. Mark Thomas, Neil Henderson, Laura Niedernhofer, and Prakash Kara– gave presentations to the Higher Education Finance and Policy Committee on the importance of the work they’re doing within their respective MDTs. Thanks to the state of Minnesota’s investment , the MDT on Addiction has been able to hire some of the best and brightest young faculty in the world, who offer expertise that will bring the Medical School’s research in new and exciting directions. “With our existing and now expanded expertise, we will make rapid advancements in the understanding of brain mechanisms of addiction and relapse, and translate those discoveries to new, effective therapies that treat addictions,” says Dr. Mark Thomas, Scientific Director of the MDT on Addiction. On the Medical School’s Duluth campus, Dr. Neil Henderson, Director of the Memory Keepers MDT, is hard at work to decrease the prevalence of diabetes and dementia in both Native American and rural populations. Dr. Laura Niedernhofer, Director for the Biology of Aging MDT and its newly formed Institute on the Biology of Aging and Metabolism– or iBAM, for short– is striving to improve the health, and the quality of life, for the elderly in the state of Minnesota and beyond. “By developing drugs that target the fundamental processes that drive aging, we hope to extend the health span of the elderly, and educate the next generation of basic and clinical scientists,” says Dr. Niedernhofer. Using advanced laser imaging techniques, the goal of the MDT on Optical Imaging and Brain Science is to produce detailed writing diagrams of the functioning brain in health and disease. Medical Discovery Teams work to advance research and care surrounding critical issues that affect our state and will change health and health care on a global level. 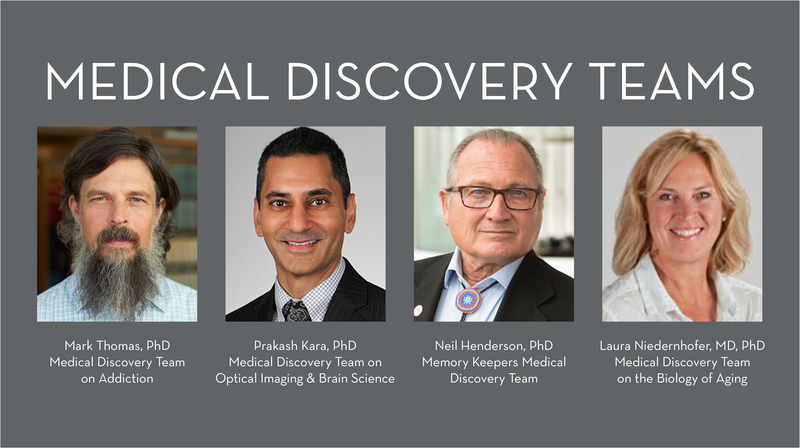 Each interdisciplinary team is focused on solving complex health problems, in collaboration with current University of Minnesota faculty working in the areas of Addiction, Biology of Aging, Optical Imaging and Brain Science and Rural and American Indian Health Disparities. Through cutting-edge research and discovery, this State of Minnesota funded initiative aims to address the state's health workforce needs.